It was a lackluster session that saw key indices close marginally higher after slipping to 2-month-lows on Thursday after US Federal Reserve stepped on the gas to taper its monthly-bond buying program. The 30-share Bombay Stock Exchange (BSE) Sensex ended 16 points higher at 20,512 levels and the 50-unit Nifty index of the National Stock Exchange (NSE) closed at 6,090 levels, up 16 points. Gains in frontliner such as ICICI Bank which ended 1.4% higher, TCS up 0.8%, Bharti Airtel 2.3%, M&M 2.4% and Reliance up 0.6% offset the losses in HDFC down 2.5%, Tata Motors 3.1%, HDFC Bank 0.5%, Sun Pharma 0.8% and Infosys down 0.1%. Broader markets outperformed the benchmark indices with BSE small-cap and mid-cap indices rising between 1.3 - 1.6% as compared to Sensex's 0.06% rise and Nifty's 0.2% uptick. "Nifty on expiry basis has seen decrease in price by around 3.8% along with fall in OI by 15% and better rollover of 72% vs 68% in previous month suggesting most of the shorts have not carried over their positions to the Feb series. PCR OI which has also jumped up above psychological one level and major put writing at 6000 strike prices indicating a bounce back move can not be ruled out in next few trading sessions towards 6200-6250 levels. One can buy Nifty at any decline with stop loss of 6030 levels. Option traders can simply buy plain vanilla 6200 call option around 55 with stop loss of 25 and target of 100-120 levels, "said Chetan Jain, Deputy Manager (Derivatives) - Equity Research, Anand Rathi. On the global front, Asian stocks slipped on Friday, as fears about the impact of the Federal Reserve's stimulus withdrawal on emerging markets offset the reassurance of upbeat U.S. growth data. With several countries, including Hong Kong and Singapore, observing the Lunar New Year holiday, volume across the region was expected to be lighter than usual. MSCI's broadest index of Asia-Pacific shares outside Japan . Japan's Nikkei stock average reversed sharply, shedding 0.9 percent as a resurgent yen took a toll on exporter shares. Back home, the rupee appreciated due to dollar sale by banks. Bullish equities also helped the rupee. At 14:20 pm, the rupee was trading at Rs 62.50 compared with previous close of Rs 62.58 per dollar. Foreign institutional investors (FIIs) sold shares worth a net Rs 430.20 crore on Thursday, as per provisional data from the stock exchanges. Realty, Metal, Oil & gas shares were in demand today with BSE Realty, metal and oil & gas indices which track the movement in the shares of these sectors closing 1.2-1.6% higher. Other sectoral index gainers were Bankex, Power and capital goods indices which gained 0.7%. Auto index was the sole laggard. Bank stocks gained after the Reserve Bank of India (RBI) laid out a road map to deal with a surge in bad loans in the banking system. Key financial data released today post market hours today showed that fiscal deficit numbers, for April-December, 2013, touched 95.2% of the budgeted target for the whole year, suggesting that capping the fiscal to 4.8% of GDP would be an uphill task. The fiscal deficit touched Rs 5.16 trillion during April-December, or 95.2% of the full year target, compared with 78.8% a year ago, government data showed on Friday. Net tax receipts were at Rs 5.18 trillion in the first nine months of the current fiscal year to March 2014, while total expenditure was Rs 11.64 trillion. Finance Minister P Chidambaram is widely expected to slash investment spending to meet the budgeted target of 4.8% of gross domestic product, highest among BRICS nations of Brazil, Russia, India, China and South Africa. 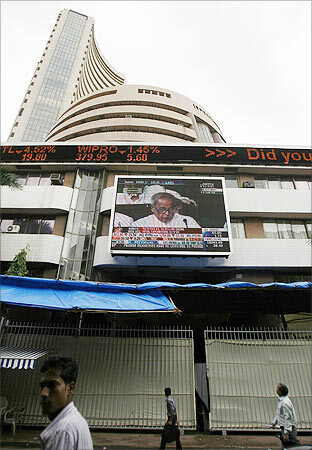 The market breadth in BSE remains firm with 1,525 shares advancing and 1,059 shares declining. Oberoi Realty surged over 2% to Rs 204 after the company announced yesterday that the Supreme Court dismissed a lower court judgment that had declared as private forest certain properties that a unit of the real estate developer wanted to develop. Arvind was up over 8% at Rs 148 after the largest integrated textile and branded apparel players, posted a 42% rise in net profit for the quarter ended December 31, 2013 to Rs 93.8 crore as against Rs 65.85 crore in the corresponding period last fiscal. Balkrishna Industries surged 7% to Rs 325 after net profit jumped 66.4% to Rs 123.85 crore on 24.2% growth in net sales to Rs 867.32 crore in Q3 December 2013 over Q3 December 2012. Aditya Birla Nuvo rose 3.75% to Rs 1,105 after the company agreed to sell its business and technology outsourcing firm Aditya Birla Minacs Worldwide at an enterprise value of $260 million. Balasore Alloys jumped 10.36% to Rs 11.61 after net profit galloped 793.02% to Rs 11.52 crore on 15.34% growth in total income from operations to Rs 188.62 crore in Q3 December 2013 over Q3 December 2012.